On July 8, 1995, we had planned to spend the day in the chalk looking for fossils with Jim Bourdon and his two teenage boys from Croton-on-Hudson, New York. Until now, the summer had been unseasonably cool and rainy. As our luck would have it, it was quickly changing to more seasonable temperatures for Kansas. The day was bright and sunny and the thermometer went over the hundred mark before Noon. Anticipating the heat, we were in the field by 8 AM and spent the morning scrambling over the rough terrain at our favorite site, "Quinter South". We had not found much and were even planning to take a mid-day break to get away from the heat when Jesse, one of Jims sons yelled something like, "This better be what I think it is!" I was about 100 feet away and had been headed toward the same spot where he was now standing, pointing excitedly at the ground. I walked over to him expecting that he had found fish vertebrae or some other common chalk fossil. As I got closer, I asked him what he had found and he just pointed at some fragments scattered down the slope of the hillside. 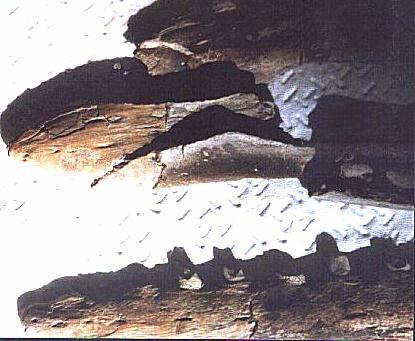 One look and I knew what it was.......the skull of a little mosasaur! We had found parts and pieces of young mosasaurs before in this area, but never one this small. The brutal fact of life in the Western Interior Sea was that most small animals were consumed by larger animals before they had a chance to grow up to be something BIG. Now excited by Jesses discovery, I got down on my knees and started to survey the site as Jim Bourdon walked up. 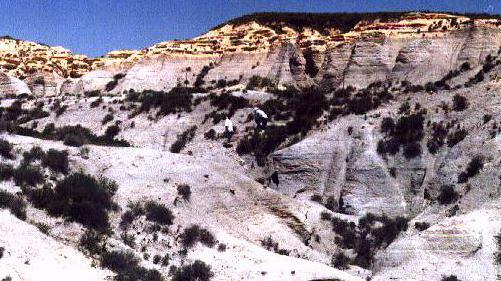 Jesse had found the skull of a small mosasaur eroding nose first from the side of the hill. The front 1/3 of the skull had broken loose and fragments were scattered down the slope. I recognized the premaxillary and pieces of the upper and lower jaws, and found where the rest of the skull was protruding from the chalk. The three of us looked closely at the surface of the chalk, trying to find all the pieces of bone that we could. A sketch was made of the general locations of the identifiable pieces and then the fragments were bagged for later cleaning, identification and possible re-assembly. I also found the closest stratigraphic marker and found that the remains were coming out of the chalk just below an ash bentonite that is referred to as "Marker Unit 4". 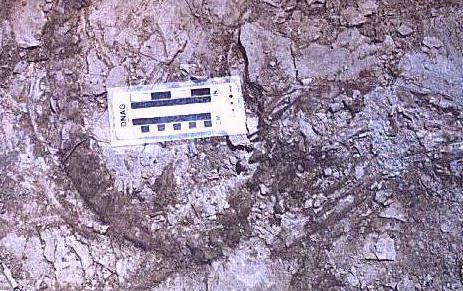 This placed the specimen in the lower 1/4 of the Smoky Hill Chalk and dated it at about 84 million years. Once the preliminary work was completed and the site swept one more time to make sure we had picked up everything, we began clearing away the 6 to 12 inches of overburden that covered the rest of the skull and whatever was attached to it. We quickly discovered that the remaining two-thirds of the skull was laying where we expected, upside down, and was still articulated with a string of cervical and thoracic vertebrae. 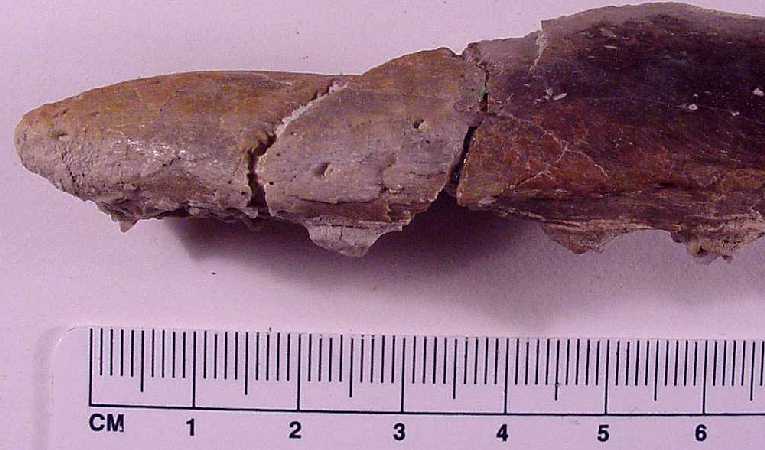 There were a few fragments of ribs, but no paddle elements, and the string of vertebrae ended suddenly, as if the animal had been bitten in two. 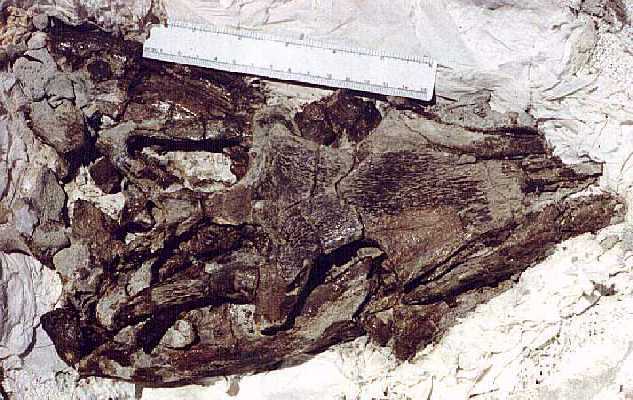 The entire specimen was about 3 feet in length and curved in a gentle arc to the right of the skull. The bones of skull also appeared to be badly fractured and we knew that we needed to put a jacket on it in order to remove it safely. At the time, we were all traveling pretty lightly in the heat and had left all of the necessary jacketing materials in our field vehicles which were parked about a mile away. It was getting hotter by the minute and the lack of a breeze made it feel even worse. We quickly decided to go back to the vans for lunch and to pick up the necessary equipment to recover the fossil. After lunch and "gallons" of water, we drove cross county in order to move our vehicles closer to the site. Now we only had to walk half a mile to get back to the little mosasaur. Because of the distance that we were still going to have to carry the jacketed fossil, Jim Bourdon decided that he would use canned insulating foam to make a light cast. We had used this technique several times before in the field with very good results. When we got back to the site, we did a final clean up of the remains and coated all exposed surfaces with Butvar. Then I took pictures of the fossil and the site while Jim built a form for the jacket around the skull. 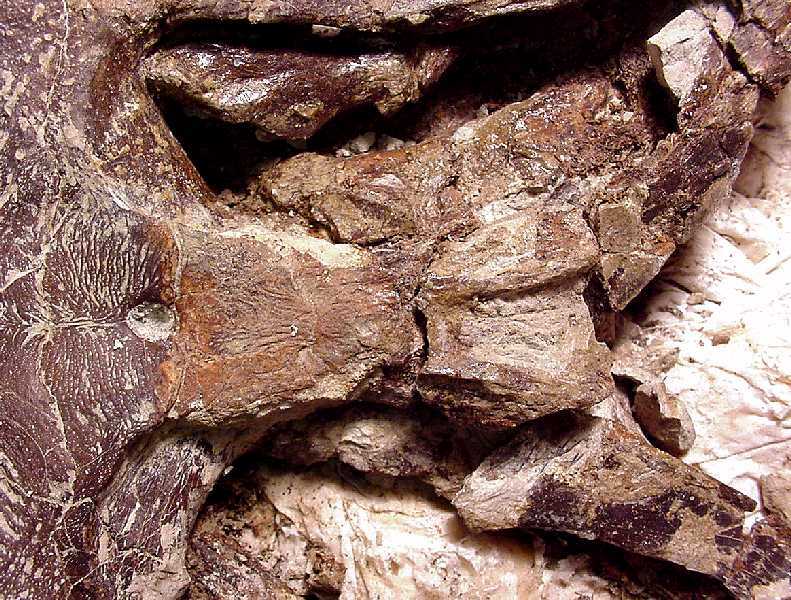 The vertebrae were carefully detached from the back of the skull, marked and packaged separately. When Jim finished his form, he covered the skull with tinfoil to protect it from the foam. Then he took out a can of insulating foam, shook it and prepared to spray it into the form. When he pressed the nozzle, nothing happened! He adjusted it, pressed it again and still nothing happened. Not too concerned, he took the second can, shook it and pointed it into the form. Again nothing happened!...... "Murphys Law" was in full force in the field that day. Two brand new cans of spray foam and both of them were out of propellant! By now the temperature was well over a hundred and we were tiring in a hurry. We packed up our gear one more time, returned to the vehicles and picked up the water and plaster necessary to do a classic plaster jacket on the skull. Drinking more water and pouring some of it over our heads, we set off one more time across the gray chalk gullies. When we got back to the site, things were all business. The skull was packed with damp Kleenex and paper towels to provide cushion to support the bones when the skull was turned over. Then burlap bandages soaked in wet plaster were wrapped around the skull in layers. Once the jacket was in place, the remaining plaster was poured on top of it and smoothed into the crevices. In the hot sun, the plaster began to dry very quickly. While it was drying, we began to dig around and under the jacket so that we could break it loose and turn it over. The chalk was pretty loose to begin with and the base of the jacket came free easily. When the "Moment of Truth" arrived, Jim and I took hold of the jacket and rolled it quickly over on its top. The worst thing that can happen at that point is for the fossil to fall out of the jacket as its being turned over, ruining the fossil and your day at the same instant. We were lucky (the more you practice, the luckier you get!). Everything stayed in place and we cleaned off the excess chalk to lighten the weight of the jacket for the long walk back to the vehicles. Twenty very hot minutes later, the skull and other pieces were secured in the van and ready to go back to where we were staying for the night. It was only about 2:00 PM but no one wanted to stay and look for fossils in the mid-day heat. Some of us were even beginning to feel the "chills" and other symptoms of heat exhaustion.....it was definitely time to get cooled off. Later that afternoon, I cleaned up and took pictures of the loose material that had been scattered down the slope. An interesting find at that point was that the animals skull had been crushed so hard (probably at the time of death) that teeth from the lower jaws were embedded in the upper jaws and vice versa. LEFT: Field picture of premaxillary and anterior ends of both maxillaries from above. Anterior portion of left dentary is in the lower portion of the picture. RIGHT: Drawing below shows approximately the same area of the muzzle from the left side. 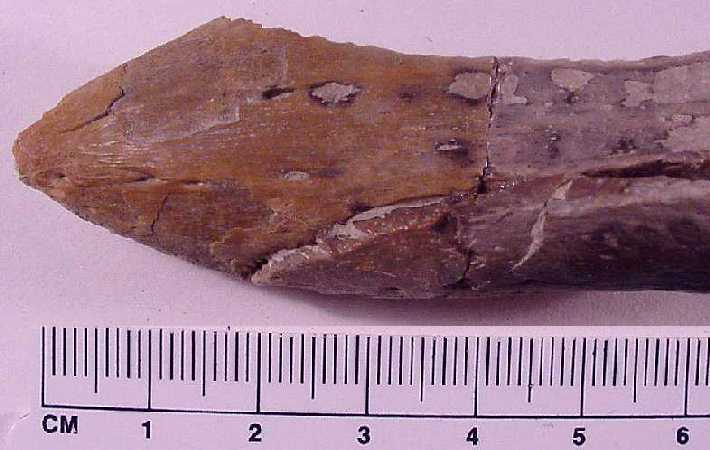 One thing kept puzzling me and that was the identification of the mosasaur. I kept trying to make it into a young Tylosaurus since that was the predominant species at that level of the chalk but the shape of the few fragments of bones that I had, especially the premaxillary, did not quite fit. I decided that it would probably have to wait until the rest of the skull was prepared. The next day we stopped by Pete Bussens place on the way to more digs in Nebraska and South Dakota. When we showed Pete the pieces that we had, he just laughed and said he knew what it was. He took us out to his "Fossil Barn" and showed us the nearly complete skull of a Clidastes mosasaur from the upper Smoky Hill chalk. Clidastes is a small mosasaur that is fairly common where he hunts, but it was certainly a new one on us. Once we knew what it was, we realized that it was a very rare find for the low chalk. 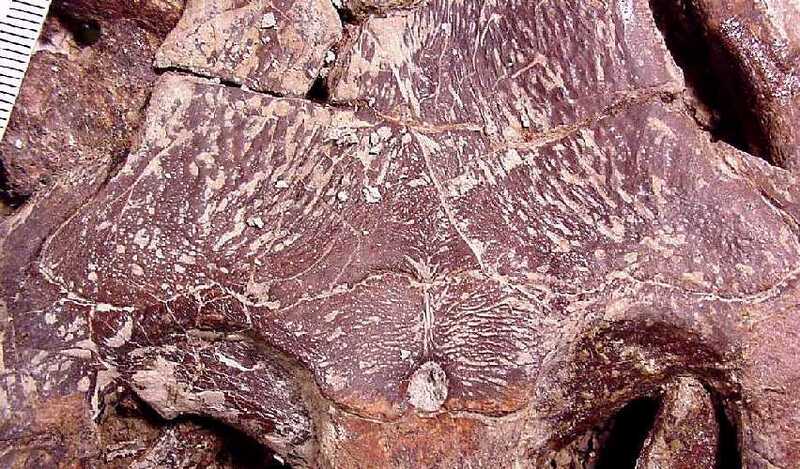 Both Jim and I had found unusual vertebrae at that level that had been tentatively identified as Clidastes but without a positive identification from something like a skull, it did not mean much. Now we had the skull. Unfortunately for me, it was Jesse and Jims skull. After we said good-bye that day, Jim took it with him back to New York where he carefully opened the jacket and prepared the rest of the material. 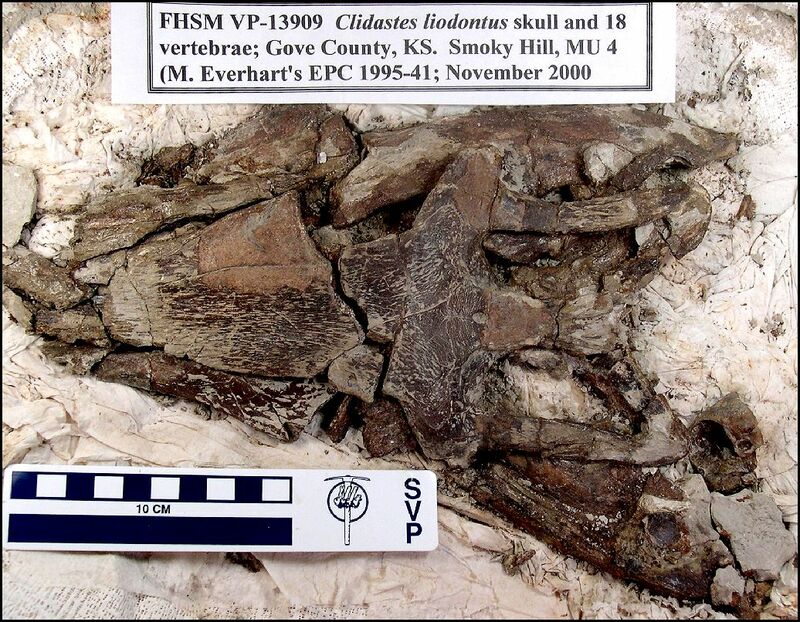 From the elements of the skull, we were able to determine the species as Clidastes liodontus, and that it did represent the earliest occurrence ever documented for that species. 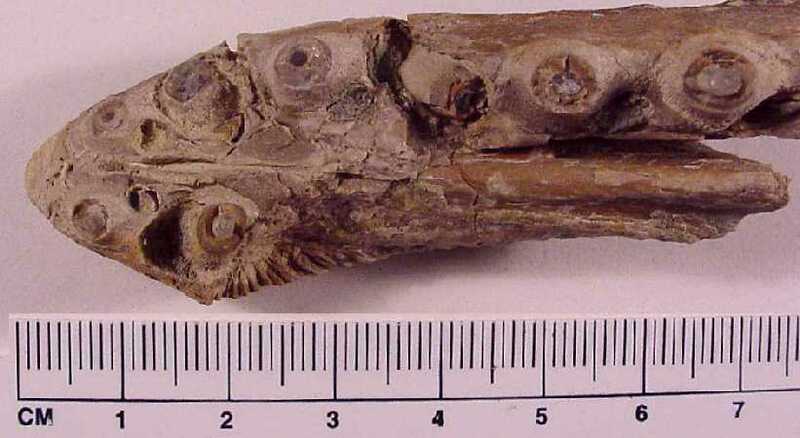 LEFT: Tthe top of the Clidastes skull as prepared by Jim Bourdon. 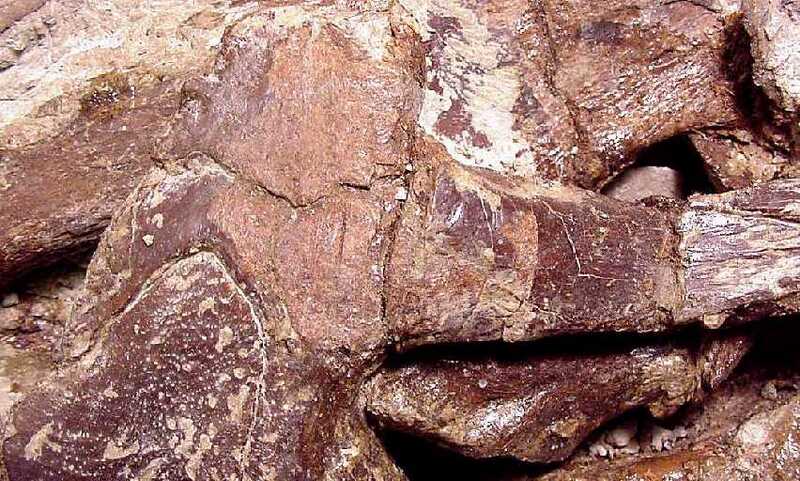 The back of the skull is to the left and the point where the skull was eroding from the chalk is at the right. The right eye would have been located in the opening in the lower center of the picture. 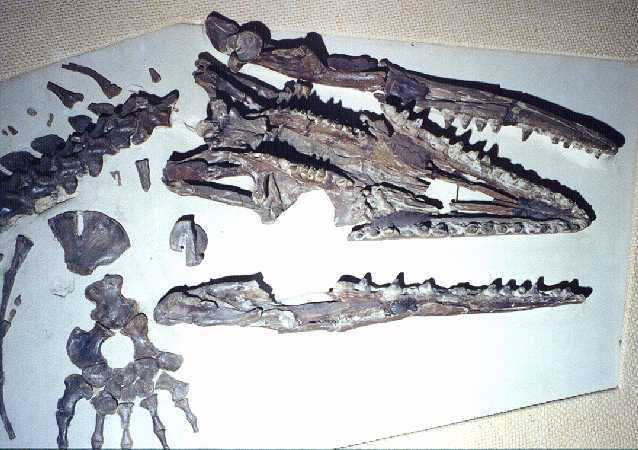 LEFT: The picture at left shows the extent of the preparation of the skull as of May 22, 1998. While the skull is in excellent condition, it is lightly constructed, and the clean-up is proceeding slowly. It appears at this point that the animal may have died from a bitten and crushed skull. LEFT: Clidastes propython (KUVP 1022) on exhibit in the Natural History Museum at The University of Kansas, in Lawrence, KS. This view shows the underside of the skull, including the teeth bearing pterygoid bones in the roof of the mouth. Samuel Williston's Clidastes velox from Volume IV of the University Geological Survey of Kansas, Published 1898. Credits: The drawing of the Clidastes liodontus upper jaw was adapted from Systematics and Morphology of American Mosasaurs, by Dale A. Russell, pgs 129 and 238, Peabody Museum of Natural History, Yale University Bulletin 23, 1967).